I am running 7.2.2 BETA 2 of 1Password and I have just noticed that my safari extension icon is gone on the browser toolbar. I have tried going in to customise toolbar, but there is no 1Password icon there. I have downloaded and installed the 1Password 7 download that says it includes the safari extension (since it looks like there is no longer the option to just install the extension by itself) and it installed fine, I got back into 1Password (it did an update to the above version) and restarted Safari. Still no icon or option to add the icon. I have exactly the same issue on multiple macs. Requires macOS Sierra 10.12.6 or later. Includes Safari extension." This would have saved me the confusion and time to try to figure it out. @grahamw - glad you solved the issue, and sorry for the delay in my reply; we're working through a bit of a backlog to get back to our usual quicker response times. Yes, in 7.2 and forward, the 1Password extension for Safari is installed directly with the app itself. But it may require you turn it on in Safari's Preferences > Extensions. @nickdring - I'm sorry for the trouble! You included a screenshot of what appears to be version 7.1.2...but not from which device that's taken from. Everything before version 7.2 (or 7.2.1 on the Mac App Store) will still be using the older-style .safariextz extension that you download from the Safari Extensions Gallery. The new Safari App Extension ships with version 7.2 of 1Password for Mac and requires Safari 12. You can still install the older version from the Safari Extensions Gallery...but it won't work in version 7.2 and beyond. Which versions do you have on all your devices (macOS, 1Password and the 1Password extension)? @invictus26 - I'm sorry for the confusion! To be clear, version 7.2 of 1Password for Mac does not require Mojave specifically, but since it uses the new Safari App Extension format Apple has switched to in Safari 12, it does require that version of Safari. That's part of the reason why we have not yet made 7.2 available via auto-update in our version of 1Password 7 for Mac to people on macOS 10.13 (“High Sierra”) and earlier. Safari 12 comes bundled with Mojave, but it's still an optional install for people on earlier versions of macOS, and we know often users will not update to a new version of core software like that until they upgrade the OS. So we've been holding off -- and interestingly, getting flak for that, too. 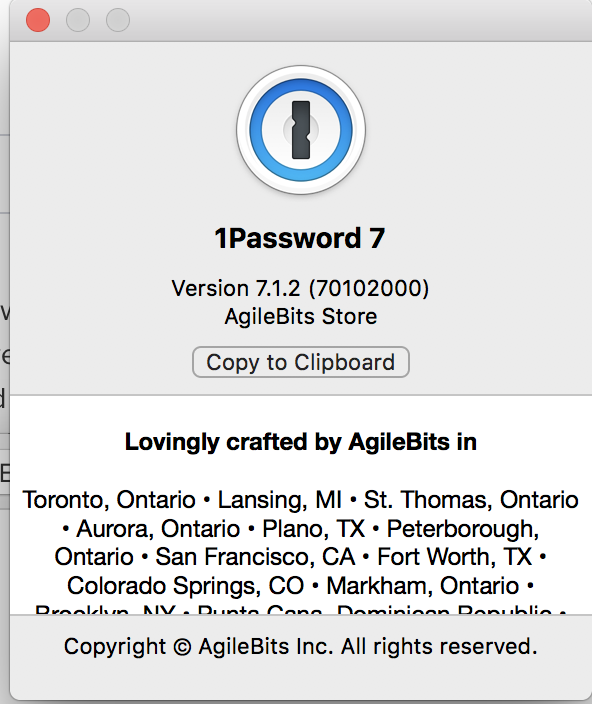 The Mac App Store version of 1Password 7 for Mac, of course, gets updated to 7.2 because we can't tell Apple to differentiate between those on Mojave and those still on earlier versions of macOS. I'm guessing you're using the Mac App Store version of 1Password 7 for Mac and you also have yet to upgrade to Mojave OR Safari 12 via the Mac App Store? If that's correct, I'm certainly sorry for the confusion, but I hope you can see why we don't include a specific warning about such a unique setup in the release notes: it would be either just confusing for most people (or possibly cause additional problems for some), or simply be overlooked. Our recommendation as a general rule is for users to stay up-to-date with not only our own software but also versions of their browser and especially macOS. I'm on the direct version, version 7.1.2, so I didn't see anything in the release notes. My situation is that I got a new computer that came with High Sierra, installed 1Password, and then tried to use it in Safari. The 1Password mini window popped up and said I needed to in stall the Safari extension, with a button that took me to a page with no Safari option. I was vaguely aware that you were moving to built-in extensions for Safari, so I spent a while trying to get that working. I don't think my situation is so rare. Mojave was released pretty recently, and it's not a bad idea to wait for a point release or two to make sure it's stable and all apps are updated. So anyone who is trying to set up 1Password for the first time on High Sierra is going to have a broken experience (unless I'm missing something). @invictus26 - perhaps it's me who's missing something. If you're on version 7.1.2, you are NOT using the Safari App Extension that's used in Safari 12. If you install 7.1.2 into macOS 10.13 (“High Sierra”), you should be able to run the older 4.7.3.90 extension quite smoothly. Yes, I can run the extension, but how do I get it? Like I said, 1Password mini pops up and presents a link to your extensions page, which excludes Safari. I guess it should instead link to the safari gallery page. @invictus26 - ah, thanks for the clarification. Apple has moved away from the older-style .safariextz extensions in version 12, in favor of their new Safari App Extensions. The latter is what version 7.2 ships with. As part of that deprecation, Apple has already banned the direct download of older style extensions from developers, meaning you cannot download our version directly from us. The only outlet Apple allows installation of the previous (4.7.3.90) version of our extension from is their own Safari Extensions Gallery. That's why our own extensions download page no longer features Safari. Hope that helps. By the way, Safari will be retiring the Safari Extensions Gallery sometime around the end of this year, if you're interested, and I don't know (because they haven't said) whether that will mean they will formally ban .safariextz extensions in Safari 12 and beyond...but it wouldn't be out of the question, since there would at that point be no way to install them anyway. @invictus26 - thanks for the feedback. @LRogers - please restart your Mac. I just tried to install the extension for Safari and followed the steps. But, when I got to Extensions in the preferences, there wasn't any 1password extension listed. When I went to your website, it says that the extension comes with 1Password 7. I couldn't find it. And, it didn't show up in the Safari extensions available. I'm using Safari 12.0.3 and my OS is Mojave 10.14.3. It is a brand new iMac. Luckily, you gave a direct link to install the extension and that did it. But, you should know, that I would never have been able to find it, if I hadn't found this thread. You should not be using the 1Password extension (v4.x) from the Safari Extension Gallery with 1Password 7 / Safari 12 / Mojave. I'm surprised that works at all, and it likely won't in the future. If 1Password 7 does not appear in Safari > Preferences > Extensions after installing 1Password 7 for Mac please restart the Mac.